LTE (Long Term Evolution) protocol standard is the so called 4G (4th Generation) mobile standard in the rapidly evolving mobile technologies. Its distinguishing feature is an all IP infrastructure and significantly greater air interface bandwidth to the mobile handset. It was developed as an enhancement to the existing 3G UMTS System (Universal Mobile Telecommunications System) to provide users enhanced mobile radio and internet access. The LTE air interface is a completely new system based on orthogonal frequency-division multiple access (OFDMA) in the downlink and single-carrier frequency-division multiple access (SC-FDMA) in the uplink. The system efficiently supports multi-antenna technologies (MIMO). OFDMA is considered much better at handling the varying propagation conditions seen in mobile radio. This is similar to WiMAX. In MIMO techniques, either multiple antennas can transmit the same data stream to improve data-transmission reliability or different antennas can transmit different data streams simultaneously to increase throughput. GL Communications Inc. have developed product suitable for LTE Analysis and Simulation with following features and capabilities. Connect to Mobile Phones, Smart Phones, and Broadband Devices using GL’s portable VQuad™ – Dual UTA system. VQuad™ can send commands to the Mobile Device Controller application residing on the smart phones to remotely perform Automated Data Testing irrespective of whether the phone is on a voice call or not. Supports emulation of for several interfaces – currently S1 – MME, eGTP-c ( S3, S4, S5, S8, S10, S11 and S16), and Diameter (S6a, S6d, S13, Cx, Dx, Gx, and Rx), X2-AP interfaces. 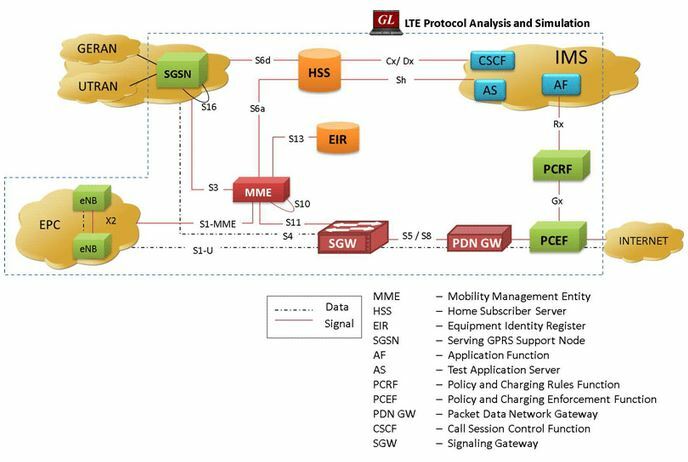 Complete LTE S1-MME interface Analysis – visit LTE Analyzer page. Complete S1-MME interface Emulation – visit Maps LTE-S1 page. Complete LTE eGTP-c interface Analysis – visit LTE Analyzer page. 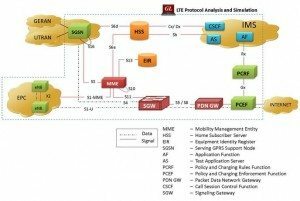 Complete eGTP-c interfaces Emulation – visit Maps LTE-eGTP page. Complete LTE Diameter interfaces Analysis – Visit LTE Analyzer page. Complete LTE Diameter interfaces Emulation – visit Maps Diameter page. Complete LTE X2-AP interface Analysis – visit LTE Analyzer page. Complete LTE X2-AP interface Emulation – visit Maps X2-AP page.